Adjustable steel anvils for producing a perfect, score-free bend on wires up to 1mm in diameter. 35 mm diameter, free-running, cutting wheels minimise minimize wear whilst maximising maximizing efficiency and ease of use. Built in scales on top of machine for pitch and down lead adjustments. Fitted guards all around the cutting and bending wheels for protection against trapping fingers. Optional plug-in sensor for electronic component counting. PM-2 is similar to PM-1 but designed to cut components from bandoliers without bending. 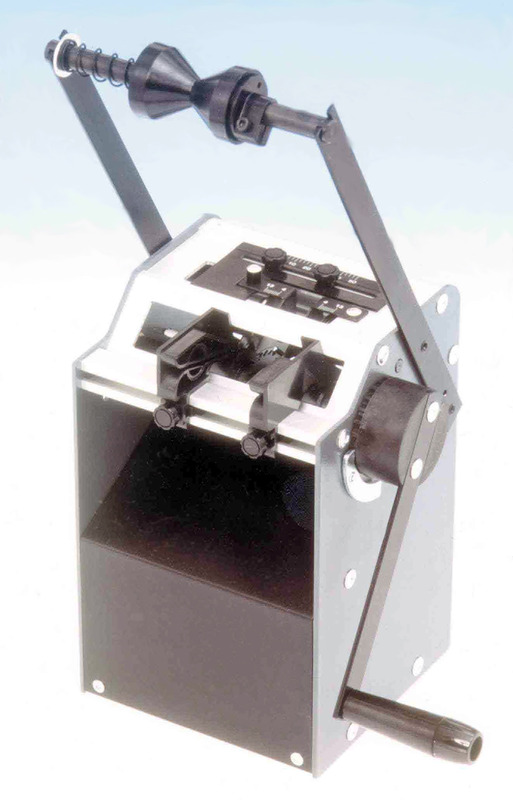 Motor drive (only) weight: 6.3 Kg. The machine is designed to cut to length and pre-form axial lead components ready for fitting into PC boards, where the component is parallel to the board. The components may be fed in bandolier form, (assuming a 5 mm pitch between components or multiple thereof), or loose by means of built-in chute slots. Finished components are collected in a standard size storage box. This may be located under the cutter head or preferably in front of the machine, using the supplied metal chute under the cutters. All adjustments are carried out on top of the machine using the built-in scales. Setting instructions are printed on the machine. Components are cut and formed without scoring or damaging the leads. Wire links can also be rapidly produced from bandoliered wire. General construction features an anodised anodized aluminium aluminum body with heavy steel sides. The free-running blades are 35 mm in diameter and produced in M2 high speed steel. The cutting and bending wheels are in high carbon steel and all are hardened and tempered as appropriate. The bandolier drum supports have lugs which latch into keyhole slots on the sides of the machine. This allows the drum to sit over the machine when in use. This system takes up less space and allows a gravity feed of components. The machine will cut and form a comfortable and effortless 40,000 components per hour. Guards are fitted all around the cutting and bending wheels for protection of fingers. Most axial lead components are nowadays supplied in bandoliered form. There are often occasions when circuit design dictates the use of components which are not PCB mounted. It is time consuming to remove components from bandoliers by hand. PM-2 is designed to rapidly cut components out of bandolier form to produce loose axial components with straight wires. 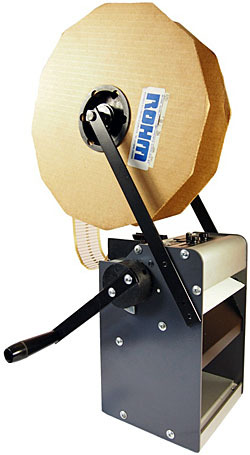 This accessory quickly converts the manual machines to electric operation. The set speed gives an output of 23,000 to 25,000 pieces per hour. 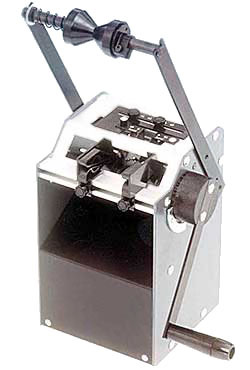 The motor drive also permits pre forming and cutting of single components by dropping them individually into the chute slots in the bandolier guides. OD664511 115V AC 60Hz USA. OD664512 100V AC 50/60Hz Japan.